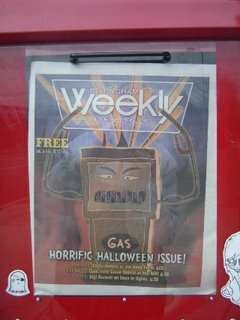 Halloween edition of our local Weekly in news stands. Gas can be ghastly. If one isn't part of a family, one can feel left out for Christmas and Thanksgiving. People will "move Heaven and Earth" just to go over the meadow and through the woods to family gatherings. They often span many treacherous miles over icy roads. Halloween is friendlier to a wider diversity of lifestyles. One is less likely to feel left out if separated from family; thus less travel. There is the family side of it; kids tricker treating and so forth, but there's also a lot more. People wear costumes at work, go to parties. It can be a wonderful creative outlet right where you live. Some of it might get a bit too crazy, especially if drinking is involved, but possibly not as out of control as New Year's. At least Halloween encourages one to celebrate where they are, even at work, for instance. There is less need to travel to family gatherings far away. This holiday can give one's "here and now" life a creative twist. Of course, part of the difference may be that Halloween is not recognized as an official holiday. It doesn't provide enough time for folks to get as far away from their everyday lives in this society where family ties tend to be scattered across the globe. An ASCII art Christmas tree and more comment.